After a full year had passed since my last marathon, race morning was finally here. My plan had been to work on speed in the spring and then run a fall marathon. Those plans went out the window when I developed a wicked case of peroneal tendonitis midway through training for the Prairie State Marathon in October. 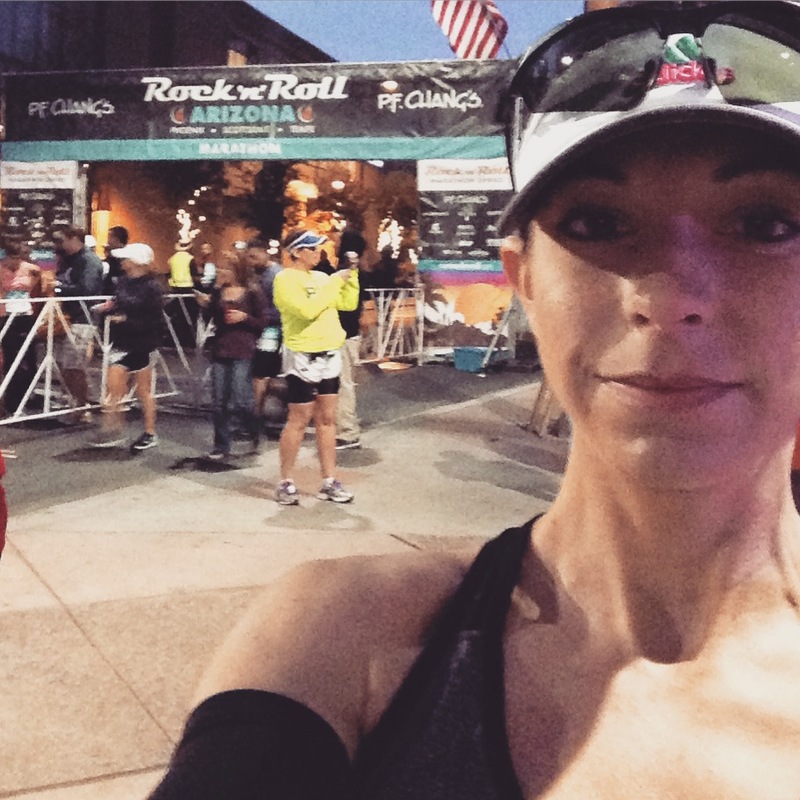 I dropped out and decided to run the Rock ‘n’ Roll Arizona instead, hopefully buying myself time to recover and fully prepare to cover all 26.2 miles. Again, training didn’t go exactly according to plan. During the first of three 20 milers I had scheduled for this training cycle, I started feeling excruciating pain along the outside of my left ankle. I stopped, massaged my ankle, loosened my shoe, but was unable to continue running. I ended up calling Mike to pick me up after only 7 miles. It hurt so badly that it brought tears to my eyes to just walk to the kitchen for a glass of water. I iced, took ibuprofen, waited a week, and then ran a 12 miler pain free. Whew! I was back on track. Then it was time for the second 20 miler. I ran the first 8 miles pain-free, then 7 more in various states ranging from mild discomfort to sharp shooting pain. Again, I called Mike to pick me up, this time at mile 15. I was beginning to have serious doubts about my ability to run this race, but I wasn’t ready to give up hope yet. I took another week off and then decided to try for an 18 miler that weekend, and a 20 the weekend after that (which should have been my third 20). If I was able to complete those runs, I would run the marathon. I did half of the 18 miler on the treadmill, mostly out of fear of having to call Mike to pick me up for a third time. Then I did the 20 outside on a layer of snow which may have helped by providing a layer of cushioning, although it did make me a little nervous about the Arizona heat – especially considering my phone got so cold that it shut off! Both runs went well, so the marathon was on. However, I wasn’t as confident as I would have liked going into this race. I knew my legs didn’t have a lot of miles on them, and that meant they were going to hurt. I usually feel pretty psyched before a race, and this one was no exception. 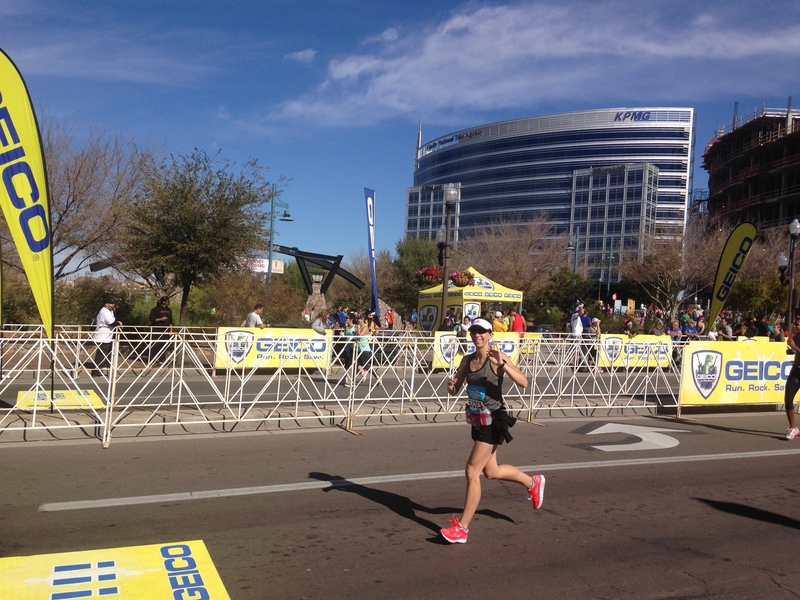 Despite the holes in my training, I got my head in the game and focused on running a good race. Mike dropped me off at the start line in Phoenix. (We would then run to Scottsdale and onto Tempe where we would finish.) It was the first time I’ve had to hang out at a start line by myself, and although the temps were going to reach near record highs (about 77 degrees), temps at the start were only in the 40s. I forgot to pack a throwaway sweatshirt (rookie mistake), and I didn’t want to throw away any of the clothes I brought, so I was doomed to freeze for awhile at the start. Luckily, a large bank right by the starting corrals opened their huge 2-story lobby for us and I was able to wait in warmth for the race to begin. Before long we were herded into the corrals and ready to start running. I decided to run with the 3:45 pace group. The pace group’s leader told me at the Expo that his plan was to run an 8:30 pace consistently through the entire race. I didn’t love that strategy; I prefer the Smart Pace strategy which has you starting slower than goal pace and peaking faster than goal pace. But I decided that the benefits of running with a group and enjoying that camaraderie outweighed the risks. I ran with the group for the first 18 miles. I talked with some of the other runners a little, but mostly I just enjoyed being in the pack. If I fell back a few feet (usually because I was eating my Cliff Shot Bloks which I did while running), I would kick my pace back up in order to rejoin the pack. And the pacer was right on. I did all of the first 20 miles at almost exactly an 8:30 pace. 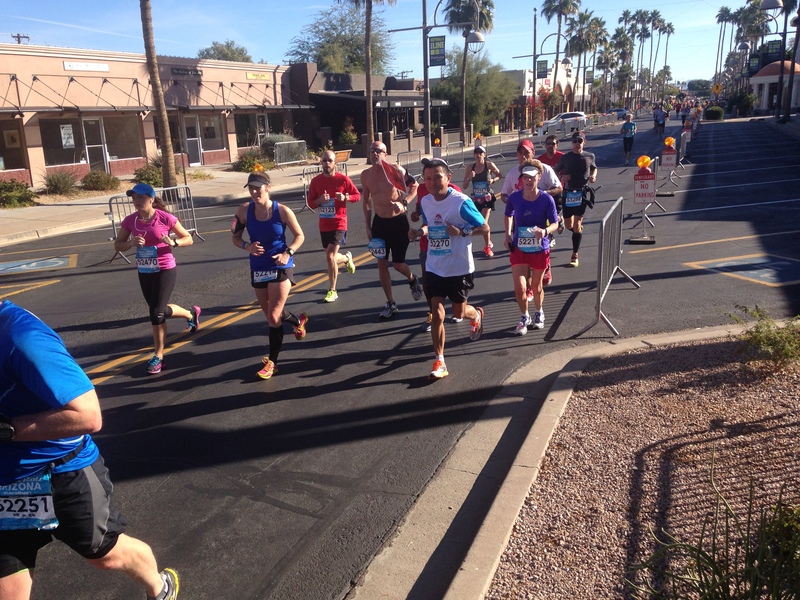 Running through Scottsdale with the 3:45 pace group. The pace leader was running his 50th marathon! Around mile 18 I slowed to get a drink of water and wasn’t ever quite able to catch back up again. The pace group by this time was about 2 minutes ahead of schedule, so they were running faster than 8:30 miles. My legs were starting to burn out big time. Plus the sun was out in full force – not a cloud in the sky. My pace slowed more than I care to admit in the last 6 miles. I pushed myself to keep moving as fast as I could. Just before Mile 25 there was a decent sized hill up to the top of a bridge. Our pacer had warned us about it, mentioning that it wouldn’t be that bad except it comes at a time in the race when you’re already feeling burned out. Sure enough, we turned a corner and there it was. The guy next to me swore loudly, and I have to say, I agreed with him. But once on the top of that hill, it was all downhill to the finish line. I was able to run Mile 26 back at the 8:30 pace, and finished in 3:46:37 with an average pace of 8:39 per mile. I was disappointed that I didn’t finish stronger, but I couldn’t complain with a decent time, a 5 minute PR, and a third marathon under my belt. I hobbled out of the finishing chute with a bottle of water, my hard earned medal, and great contentment knowing I had raced as hard as I could that day. 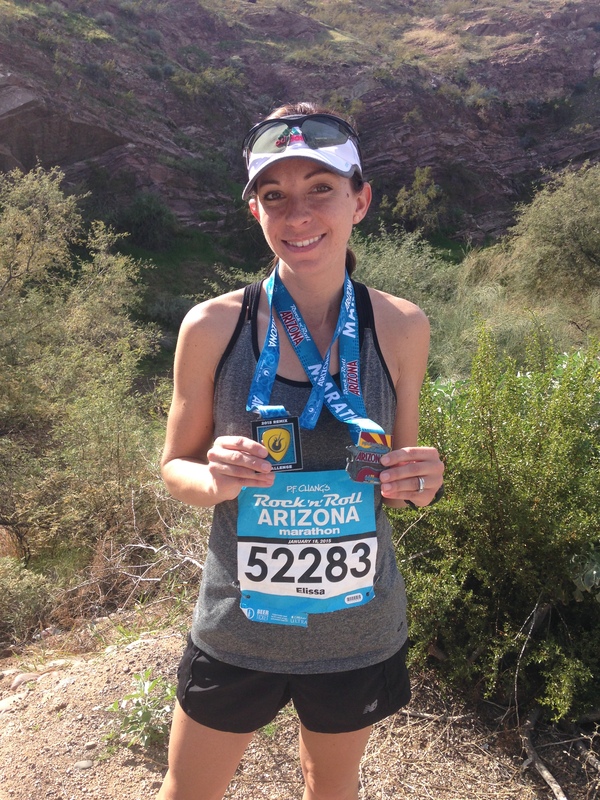 Two more medals to add to the collection, taken with the perfect desert backdrop. We stuck around the after party just long enough to collect my Remix Challenge medal and finisher’s jacket. Then we grabbed some In ‘n’ Out burgers and took them to eat next to the pool at the hotel. Perfect post-marathon gluttony. After showering and resting for a little while, we were ready to enjoy our last day in Arizona. We spent a short amount of time at a casino (where we lost money way too fast), drank a muscle-relaxing beer at the casino bar (where we saw the Seahawks make it to the Super Bowl), then drove to Downtown Scottsdale for some shopping (where we bought dream catchers as souvenirs for the girls). 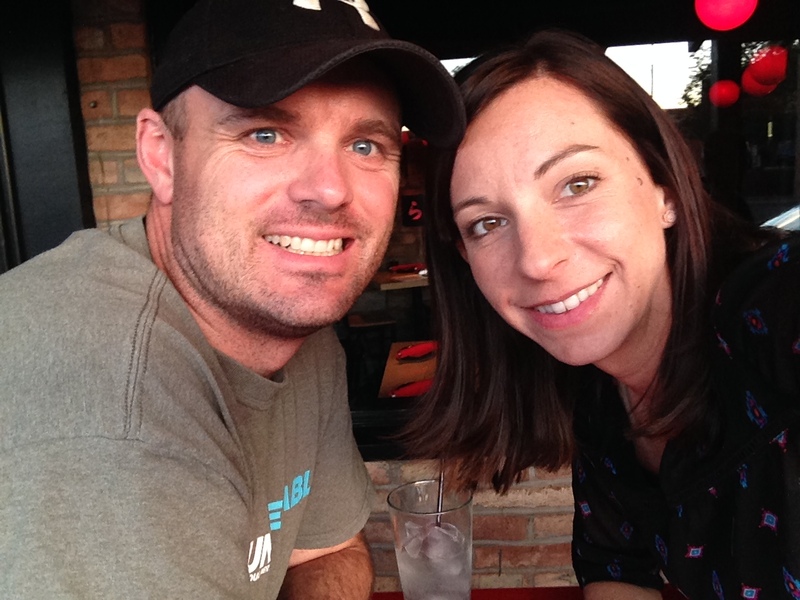 Then we had our favorite date night meal, sushi. The best part was eating comfortably on a sidewalk patio without coats. Ahh, Arizona in the winter. It was a fun, well-run race, and an even better weekend. I came home with a lot of swag…and one giant blister which I don’t have enough self-control NOT to share with you. Enjoy! Swag! 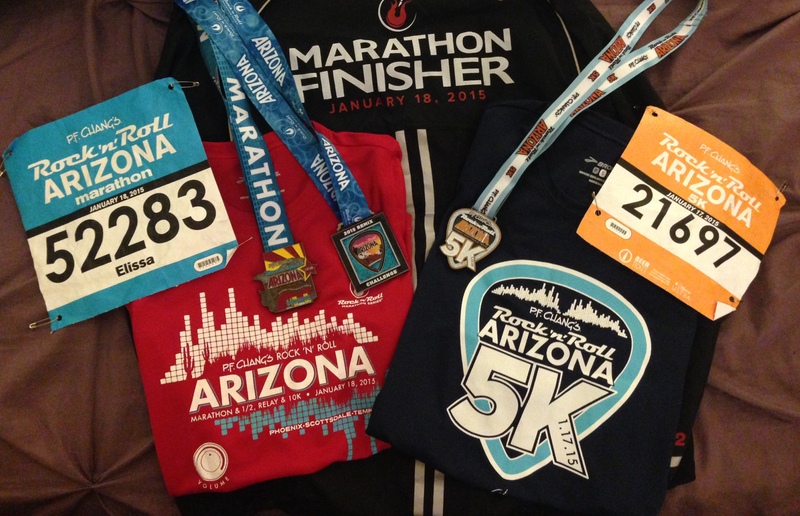 2 bibs, 2 shirts, 3 medals, and a finisher jacket. Luckily, I didn’t feel this at all during the race, just discovered it when I took off my sock!